After dominating college football, Earl Campbell brought a new kind of ground game to the NFL and established the standard for running backs breaking into the league. 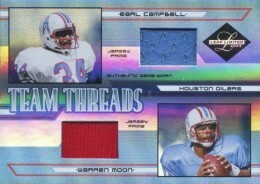 This top list encompasses the best Earl Campbell cards from his playing days as well as appearances in recent card sets. 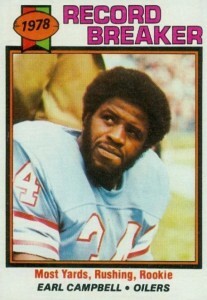 Shop for Earl Campbell Autograph Cards on eBay. A Texas native, Campbell was a two-time All-American with the University of Texas. In his senior year with the team, he led the nation in rushing with 1,744 yard and won the 1977 Heisman Trophy. The following year he would be selected as the first overall pick in the 1978 NFL draft by the Houston Oilers and he would certainly live up to that high draft position. In his first pro season, Campbell paced the league in rushing and was named the Offensive Rookie of the Year. Earl would lead the NFL in rushing in each of his first three seasons, becoming the first running back to complete such a feat. 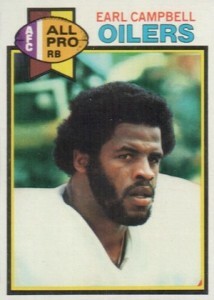 Overall, Campbell's best season was in 1980 when he led the league in rushing and fell just short of reaching 2,000 rushing yards for the season. Capping a legendary career, Earl Campbell became of member of the NFL Hall of Fame in 1991. He is also part of an exclusive group of just three players to achieve such a high level of success at the college and pro level by winning the Heisman Trophy, becoming the top pick in the NFL draft, and being elected to the NFL Hall of Fame. 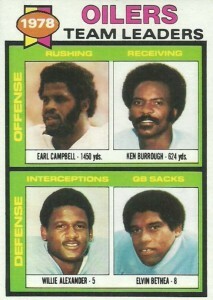 Campbell's football card appearances from his playing days are severely limited due to the breaking down of contract negotiations between himself and Topps. While he was featured prominently in the 1979 Topps set, he would not have another Topps card produced during the rest of his playing career. Collectors can find brief glimpses of Campbell on the Oilers team cards featured in the Fleer Team Action sets during the late 1970s and early 1980s but those cards are not specifically his. However, since retirement, Campbell has appeared on many trading cards, including modern sets like 2015 Panini Prizm and 2015 Topps Chrome. There are also some beautiful painted cards of Campbell in the 1991 Pro Set series honoring his election to the Hall of Fame and in 2002 Donruss Gridiron Kings which featured painted cards along the same lines as baseball's Diamond Kings. While a typical top list would include many cards from a player's active career, Campbell's unique situation requires more modern cards and autographs to be included and each card's value is balanced with availability to built a comprehensive collection. 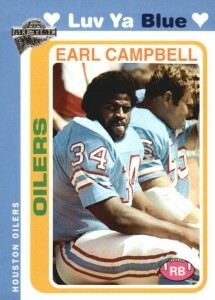 Campbell fans can find a "card that never was" with Earl featured using the 1978 Topps Football design in the 2004 Topps Fan Favorites set. The top reads "Luv Ya Blue," which was slogan from Oilers fans during Campbell's time with the team when they experienced a resurgence and became a playoff contender again. 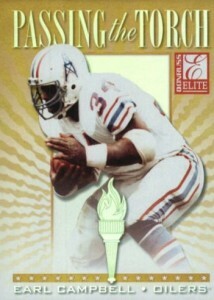 Earl Campbell is featured on two Passing the Torch inserts in the 1999 Donruss Elite set. The first features Campbell with a lengthy biography on the back. 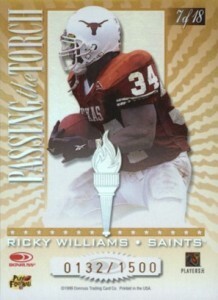 The other card, featured below, has Campbell on one side and another University of Texas running back, Ricky Williams, on the reverse side. Both cards are numbered out of 1,500 and there is also a signed version of each card that is limited to the first 100 copies of the total print run. The greatest running back and quarterback in Oilers' franchise history crossed paths for only half a season in 1984 before Campbell was traded to the New Orleans Saints midway through the year. Oilers fans can track down these great dual relics in 2005 Leaf Limited with varying levels of scarcity. Starting in 2010 when Upper Deck acquired the collegiate football license, Earl Campbell autographs and relics were include in the high-end Exquisite Collection series. 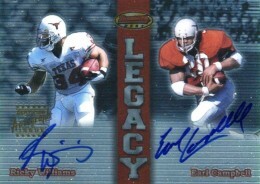 The card below can be found in 2014 Exquisite and showcases Earl in his Longhorns jersey. Cards from each of the recent Exquisite sets offer great opportunities for University of Texas collectors to track down a lovely Campbell autograph. One of the few non-Topps Campbell rookie-year cards comes from the NFL Players Association itself in the form of these pennant-shaped stickers. Campbell's pennant is the key card of the 50-sticker set. 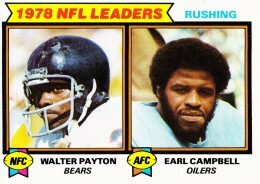 Holding the most value in the checklist, Campbell is followed closely by Walter Payton's sticker. The football edition of the 1999 Bowman's Best set includes a remarkable Campbell card featuring him alongside another Heisman Trophy-winning Texas running back in Ricky Williams. Williams was a rookie for the New Orleans Saints in 1999 and was considered a power runner in the mold of Campbell. For those unfamiliar, Sportscaster cards were an informational release available through a subscription service in the late 1970s. The sets were created over a three-year period and feature over 2,000 different cards from every major sport. 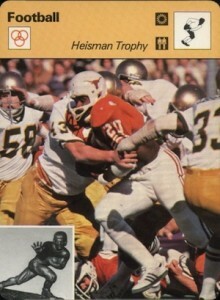 Campbell is featured rushing against Notre Dame in the 1977 Cotton Bowl on his card that was part of the 61st 24-card set they produced. Along with what is considered Campbell's proper rookie card (we will discuss that in a moment), Earl was also featured on three other cards in the 1979 Topps set. They include a Oilers team leader card, a record breaker card, and an NFL Leaders card that he shares with Walter Payton. All three are sought-after because of the limited trading card population for Campbell during his active career. It is clear that if Topps and Campbell could have reached an agreement to produce more cards that he would have been prominently featured in the sets for many years to come. One of Campbell's earliest certified autographs can be found in 1999 Upper Deck Century Legends which featured many of football's greatest players including many of those players' first certified signature cards. 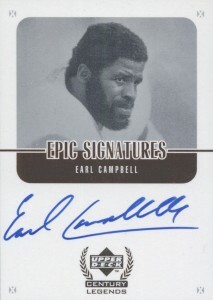 The card design provides for a nice big signature and Earl's autograph is notable for the bottom part of the "C" in Campbell that stretches below his entire last name. Campbell's amazing start in the NFL, coupled with the nearly complete lack of trading cards issued for him during his career, has made this card one of the most popular football cards of the last 35 years. It is the high-water mark in terms of value for the 1979 Topps set and mint graded copies of the card can approach $500 at auction. 2008 Leaf limited Earl Campbell Team Trademarks GW-Jersey #100 100 Oilers!! !